Feature image (above): Mono-plane – sculpture of a single propeller aeroplane by Yvonne Koolmatrie, 1991- 1992. Photo by George Serras, National Museum of Australia. Image reproduced with permission. Aboriginal and Torres Strait Islander readers are advised that the following blog may contain the names of people who have died. When I first saw Yvonne Koolmatrie’s inspired creation of a woven Mono-Plane (pictured above) it was the artistry of this object that caught my attention. But I have since begun to think of this object as a powerful example of the dynamic continuation of culture across time and place. Aboriginal and Torres Strait Islander culture is often represented as ancient and deriving from the deep past rather than as living, innovative and ever-changing. I was intrigued by the notion that this work celebrated the innovation of Ngarrindjeri culture and provides an interesting link between Aboriginal cultural expression and aviation heritage. Yvonne Koolmatrie’s Art Gallery of NSW artist profile tells us that she lived all her life in Ngarrindjeri country (SA) and notes that in 1982 she attended a workshop where she learnt the traditional coiled bundle technique of weaving and how to correctly harvest and prepare sedge grass. This workshop was conducted by Elder Dorothy Kartinyeri, who was one of the last people practicing this method. Following the workshop, Koolmatrie contributed to the revival of Ngarrindjeri weaving traditions through the construction of unique sculptural forms. In this way, ancient Ngarrindjeri weaving traditions are intrinsically connected to her contemporary practice. The National Museum of Australia’s catalogue description also reveals an important component in the story of this work. It describes Koolmatrie’s Mono-Plane as a reproduction of an original artwork made by Janet Watson in the 1930s. 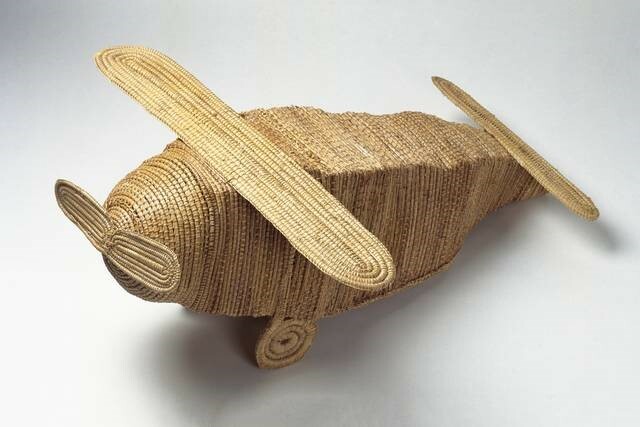 Watson’s woven aeroplane is held in the South Australian Museum and is the first known Ngarrindjeri fibre sculpture. I made this plane because my brother left in it when he went home to go shearing. It was the first time I saw a plane. 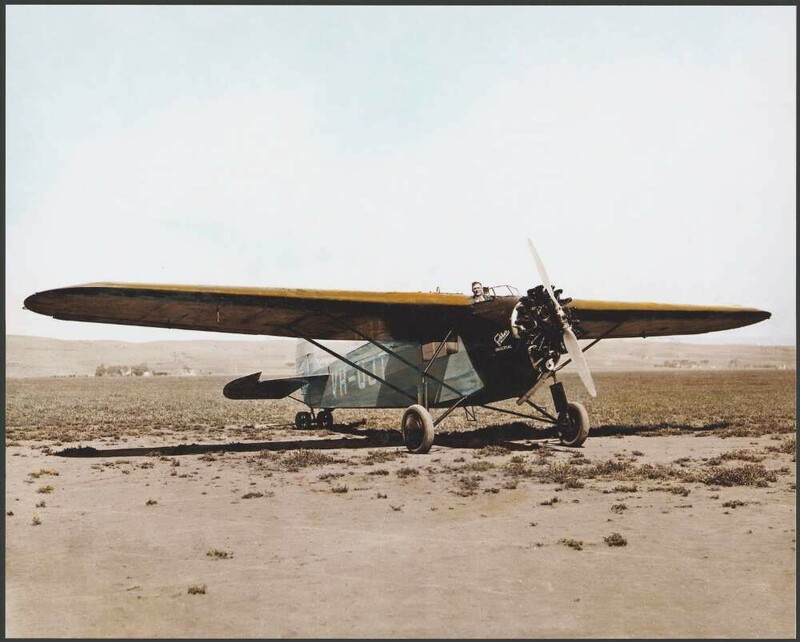 Following this initial response to a family member’s travel and her first encounter with a plane, Watson’s creations passed through several hands before eventually landing in the South Australian Museum. This history reveals how objects will often have complex biographies as they acquire new stories through their changing relationships to people and places. ‘This object was the first aeroplane made by Janet Watson. This and the second, a biplane, were sold to an Aboriginal man named Nulla Richards. The plane that the basketry is based upon was possibly the Fokker Universal aircraft flown by Horrie Miller from Adelaide early in the 1930s-probably. The exact details of how the model came to the Point McLeay School, and finally to the South Australian Museum, are not known. Credit: Horrie Miller in the cockpit of his Fokker 4 Universal transport aircraft VH-UJT, South Australia, ca. 1930, National Library of Australia. Weaving can connect people across time, from the past into the future. The links that come from further exploration of an object such as Koolmatrie’s Mono-Plane, can be likened to the process of tracing the threads that have been tangled in a complex and complicated weaving or network of cultural and historical connections. By revealing the inspiration for the Mono-plane we can see how it recalls Watson’s first contact with aviation technology and the emotional impact it had on her and her family. This resonance continues through the work of Koolmatrie, connecting her to Ancestors and culture through traditional weaving practices of the Ngarrindjeri and symbolising connectivity and continuity across time and place.